The 46th annual UWinnipeg Duckworth Great Rock Climb will be held on Friday, September 8 from 12:30 pm to 1:30 pm on the campus front lawn (Portage Commons). 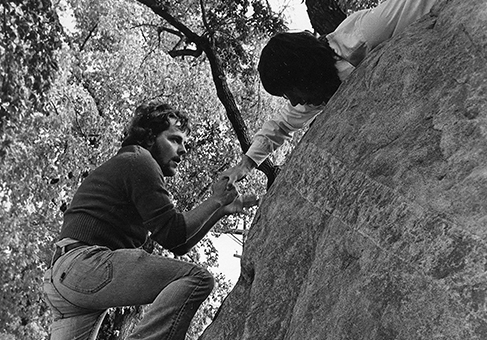 It is a tradition on our campus to conquer the rock at the beginning of classes each year. Teams of three compete, with a goal of racing from the steps of Wesley Hall and climbing the rock in the shortest time possible. The current record to beat, set in 1979, is 9.4 seconds. The winning team gets all three members’ names engraved on the UWinnipeg Duckworth Great Rock Climb trophy. To sign up for the Rock Climb please fill in our registration form [PDF]. For more information please contact events@uwinnipeg.ca.